After 5 great years of Sylvia Alton MBE being Chair of the society, where have seen the society grow and develop reaching new audiences, we now have the pleasure of welcoming our new chair Deirdre Murphy to take over the reins. collections at the Gallery of Costume in Manchester, the textiles and fashion collections at the V&A and curates exhibitions and the Royal Ceremonial Dress Collection at Historic Royal Palaces. 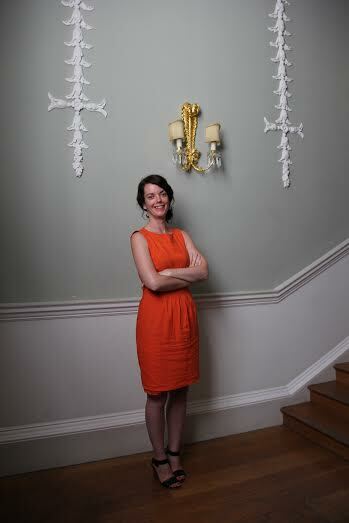 She is an Associate Lecturer at London College of Fashion, Central Saint Martins and Leeds University. As Trustee of the Costume Society from 2010, Deirdre launched the Costume Society’s Facebook page and initiated the Costume Society Ambassadors scheme in 2014. She has been a member of the Costume Society since 2002 and is a Fellow of the Royal Society of Arts. Her vision for the society is to focus initially on increasing the awards we give to support people starting careers in fields relating to our field. For 2015, we will merge our 5 awards into a single fund. We will fundraise against this Jubilee Award Fund to increase its size so we can offer better support to researchers, emerging designers, museum professionals and costume makers. Secondly, the society will expand the Ambassadors scheme we launched earlier this year. We appointed 5 Costume Society Ambassadors - students and young people who receive a year’s membership and subsidised travel to our events in exchange for writing blog posts and creating content for our website, Facebook, Twitter and other social media platforms. This will encourage young people who cannot afford it to get involved. This is an exciting opportunity for the society to both increase our membership and seek donations and sponsorships so ensure that we can mark this landmark year. During the next few months, we will think about how we articulate the aims the Society fifty years after its founding. While we do this, we need to guarantee the Society's survival into 2015 and beyond. If you would like to make a donation to the Jubliee fund you can do so by post or here on the website though our donations page http://costumesociety.org.uk/site/donate.